"Like my Green Man Pendant, my circular Green Man Brooch is made in green and black enamel on copper and based on an ancient symbol. It is also about 4cm in diameter. Naturally, I only make this brooch mainly in green, the design being drawn into the final layer of enamel before it is fired. 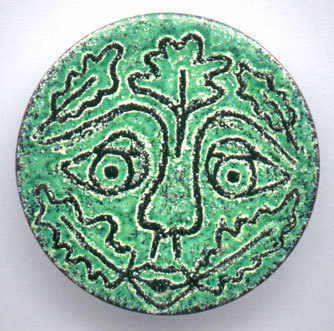 The Green Man Brooch has a plated metal brooch pin and is supplied in a gift box, as is all my handmade enamelled jewellery."